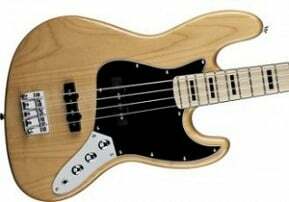 Leo Fender invented the fretted electric bass when he released the Precision Bass in 1951 and the Fender bass has been the dominant force in the market ever since. There have, however, been a number of bass designs from the Golden Era that have maintained an identity and a place in bassists’ hearts. The Eastwood EEB-1 is a tribute to one of these, namely the Ampeg AEB model that first saw the light of day in the late 1960’s. At first glance, it is an unusual-looking instrument, with F-holes cut completely through the body and a cut-out headstock, but it does have a certain elegance to it that can’t be denied. It seems to have been made to resemble an upright bass, but with a modern art-style edge to it. 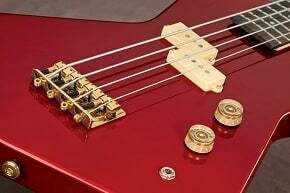 The bass features a mahogany body coupled with a maple neck with a rosewood fingerboard built to a 34” scale. Electronics are a single Alnico EW humbucking pickup and volume and tone controls. The bridge is a Fender-style top-loading affair with a chrome cover. It can be obtained in either a sunburst or black finish and retails for $899.00 without a case, which is quite a bit less than a vintage Ampeg model goes for on the vintage market. The EEB-1 has a loud and punchy sound, thanks to its humbucker, and has a true vintage feel in the hands due to an old-school fat neck carve and small frets. It is also light in weight and balances well on the strap. Fit and finish are good, especially for a Korean-made instrument at this price point. The EEB-1 would be an excellent choice for any player into the warm bass sounds of the old days but who wants something other than a Fender bass. There are certain bass players who swear by the Ampeg originals and the Eastwood will surely inspire the same kind of loyalty, especially for those who wish to stand apart from the crowd. This is truly one for the ‘rugged individualist’ types out there and, if you see yourself as one of them, this could be your next bass.